In my Book Review: The Marriage Plot by Jeffrey Eugenides I talked about the fear and apprehension that sometimes come with reading something new by a ‘Literary Giant’. I could very easily have included Richard Ford in my list – his status as a giant of American literature is beyond question – but it simply didn’t occur to me that I would ever find his writing intimidating or disappointing. I never have, and I’ve been a fan since The Sportswriter (1986). 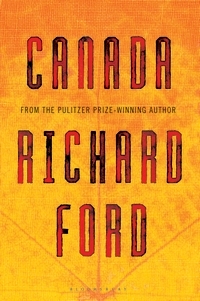 Canada is an appropriately huge novel, not especially in its length at 400 pages, but in every other respect: the writing displays the virtuosity and the compelling and original storytelling readers have come to expect from Ford, but he also takes on enormous philosophical questions without weighing the whole thing down. The word that keeps coming to me is extraordinary. I was so awestruck by the first chapter that I couldn’t read on until the next day; there was more greatness in it than in many of the best entire books I’ve read. This is the story of strange events and even stranger people, the most ‘normal’ of whom (whatever that means, and just about everything is called into question here) is the first person narrator, Dell Parsons, the 15 year old boy whose voice and point of view carry what could easily have been an overly surreal and chaotic story. His account is to an unidentified audience but although the novel opens in this vein, it’s not often mentioned – and that’s a good thing. First I’ll tell about the robbery our parents committed. He is looking back from a point many years in the future, still trying to make sense of things that are unfathomable and knowing that he never will, but that doesn’t interfere with the immediacy of this testimony of an adolescent whose entire life was changed by the actions of people who should have known better. Dell’s father Bev Parsons is a charismatic ex airman struggling to find a living after retiring from the military; his mother Neeva is an introverted, educated Jewish woman removed from her own community and unwilling to become part of any other as the family move frequently between airbases all over the States. The isolation she inflicts on her family has alienated the thoughtful and sensitive Dell and his twin sister Berner from other people and even from each other. The story opens in 1960 in Great Falls, Montana, one of the random places they have ended up in, and Dell wants nothing more than to start a new high school, to make friends and get an education. The novel is more or less written in two halves followed by a very short section set in 2011. Part One deals with the build-up and immediate aftermath of the robbery. I found this a fascinating novel from a technical perspective. The whole of the first half is an exercise in dramatic irony – as you’ve already seen, the reader knows of the crime from the very beginning and also that the couple don’t get away with it. Foreshadowing, let alone on this scale, is itself very hard to pull off (and often disliked by readers) but here it only adds to the tension as the What? is sacrificed in favour of a gripping How? and the biggest question of all, Why? As Dell says: Our parents were the least likely two people in the world to rob a bank. However, I did think some specific details of the story lost dramatic impact by being revealed in advance. .. they were no doubt simply wrong for each other and should never have married or done any of it; should’ve gone their separate ways after their first passionate encounter, no matter its outcome. It just so happens I know all about that, and the way Ford captures the atmosphere of tension and unpredictability (heightened here by events), the never being quite sure how things stand at any given moment, is absolutely superb. There is one of the most arresting examples of paralipsis (where the narrator draws attention to something by pretending to gloss over it) I’ve ever seen. The uncomfortable interactions and contrasts with the group of ‘Indians’ who bother his father and the ‘Lutherans’ attending the church opposite the house paints a vivid picture of American life in places where nothing much ever happens – making it all the more remarkable when something finally does. What this book isn’t, or at least I didn’t think so, is a book about Canada in the way you might expect. Only Part Two is set there, and it’s not the Canada of popular imagination with peaks and lakes, but Saskatchewan, the remote place of endless prairie and nothingness where Dell finds himself after his family disintegrates. Some quick thinking on his mother’s part has ensured his escape across the border to evade the State of Montana’s juvenile services, and he finds himself under the nominal care of fellow American Arthur Remlinger and his right hand man Charley Quarters, a métis (person of French and Indian origin). It is hard to imagine two less suitable influences on a vulnerable boy than these guys, both of whom are neglectful, frightening and eccentric; they hold a fascination for Dell who has nobody else, holed up in a godforsaken abandoned town. Despite my outrage towards them, I found these characters compellingly enigmatic and abhorrent. I also loved Ford’s brutal descriptions of harsh and ugly places, a kind of writing I always enjoy when it’s done well. It seemed to me, cast off in the dark, that I was not exactly who I’d been before: a well-rounded boy possibly on his way to college, with a family behind him and a sister. I was now smaller in the world’s view and insignificant, and possibly invisible. All of which made me feel closer to death than life. Which is not how fifteen-year-old boys should feel. So much of this book is about chance and identity – who and what makes us who we are, why we do the things we do and how much of it comes down to being a in a particular place at a particular time. As Dell reflects many times, Canada is really no different to the USA, the border meaningless – except as the central metaphor in this story of blurred lines and how easy it is to find yourself on the wrong side. This is an exquisitely written, profoundly thought-provoking, cracking good story. It’s the best book I’ve read this year. Later this week, Susanna Quinn, author of Glass Geishas, reveals her secrets of successful plotting when she joins me as Guest Author on the Literary Sofa. Great post Isabel. This was already on my to-read list, but you’ve made me think i should put it to the top. In case you’ve not seen, Richard Ford is appearing at the South Bank in early October. I’m going! Definitely worth ‘promoting’ on your TBR I would say! Thanks for telling me about the event, I’ve booked to go too. The irony is, I am normally at the South Bank all the time for my writers’ group, but because of the long summer break I hadn’t seen anything about it – so pleased I’m not missing out. Those author events are always so inspiring!